Well, what can I say? After everyone telling me so much about Pantelleria. I didn’t quite get it when I arrived. But when it was time to leave, it was hard to go. On the day after I landed, by the time afternoon rolled around, I had curled myself up on a cushioned chair with a book I’d been looking forward to delving into. Then suddenly, I found myself waking up a few hours later, realizing that I had collapsed into a deep, profound sleep. It was the combination of silence that’s nearly impossible to find nowadays, and soft sunshine with a lazy breeze, which were no match for my hyperactive nature. It was one of the soundest slumbers I’ve had in the last few years. Either that, or the airline drugged me. But man — that felt good! 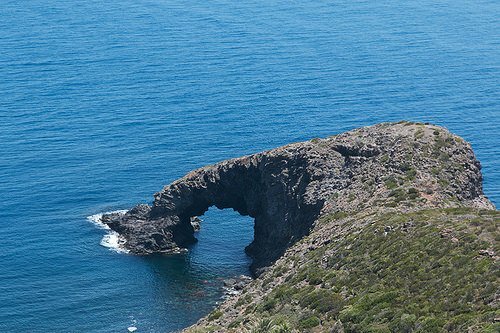 And it was worth the several hour delay (for some ambiguous reason, that no one at the Palermo airport could quite explain), that it took to fly to Pantelleria from Palermo, a short flight lasting only about 45 minutes. But once you step off the plane in Pantelleria, you find yourself in a tiny airport, and you can just dial down the world. 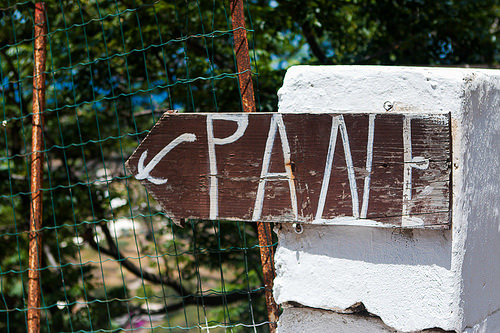 Pantelleria is that kind of place. It’s not full of designer shops, upscale restaurants, and sandy beaches. The beauty is the rugged terrain, and the serenity. You can choose to explore the island by car, or just stay in and do nothing. Me and my friends did a little bit of both. 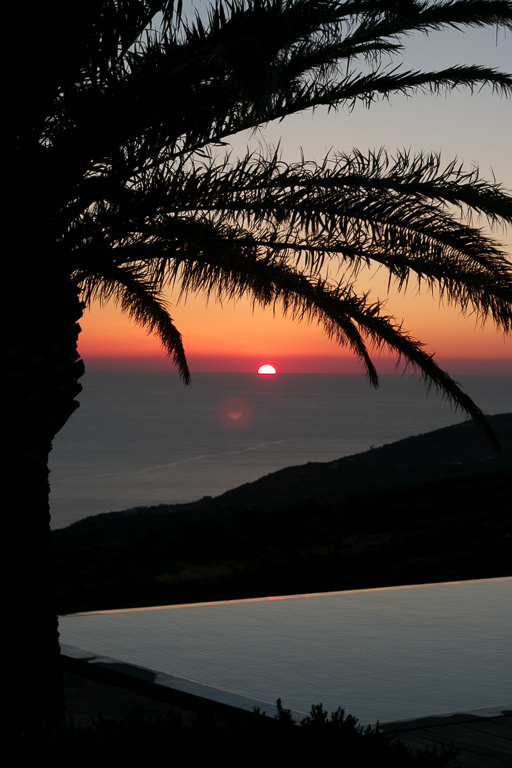 We are taken care of by our friend Giovanni Matta who operates In Sicily, and knows Pantelleria better than anybody. And who made sure we saw the best of the island. 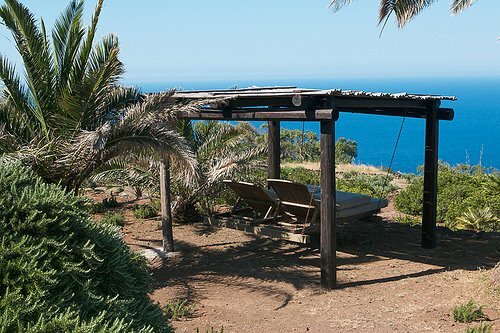 He also runs the Pantelleria Collection, an assortment of rental homes, and he was kind enough to let us stay in one for the week. 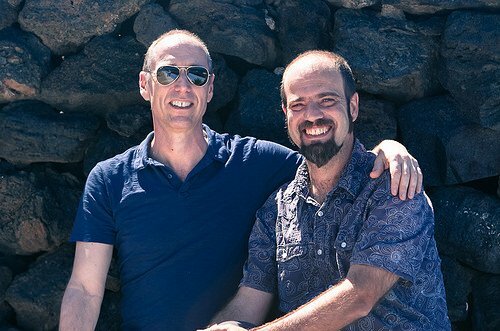 I can honestly say, if you’re coming to Pantelleria – or anywhere else in Sicily – you can’t be in better hands than those of Giovanni. While I wasn’t able to repeat that restful snooze, as the week passed, I felt myself being lulled into the rhythm of island life. But it was explained to me that residents of the island were less-interested in the sea that surrounds them, because they’ve been invaded during their history, by people arriving on their shores. That, and a lot of massive volcanic rocks that line the coastline, means that if you want to come and swim, you should find a place with a pool. Which we had. Because Pantelleria is closer to Tunisia than Italy, (it’s about 40 miles to Tunisia, and 80 mile to Italy), there are heavy North African influences on the island, from the flat houses with white-domes that blend into the landscape, to the cuisine, which often features North African ingredients, including couscous, pine nuts, honey, dried fruits, and spices. 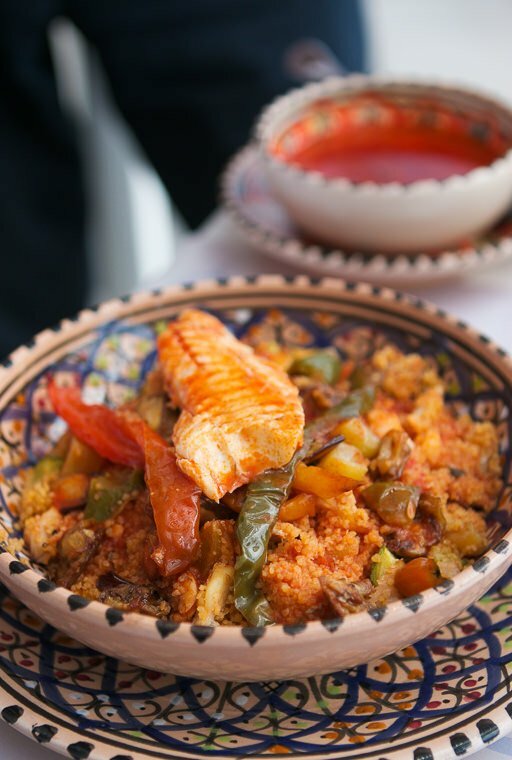 One of the best dishes we had that week was a lovely seafood couscous at Altamarea restaurant. 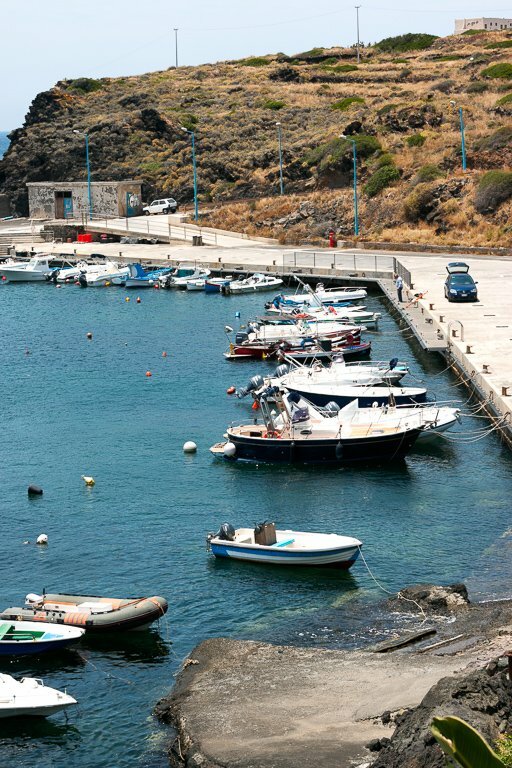 Although Pantelleria is an island, it’s not especially known for its seafood. And I only saw one fish market on the island, which is kind of unusual. But most of the seafood I was told, comes from mainland Sicily. After that disappointing first night dinner (because the island has high turnover, restaurants can vary and change, from day-to-day – you might have a great meal one day, and return the next, to find it mediocre, or crummy – which we learned was true), we found ourselves at the aforementionedAltamarea. 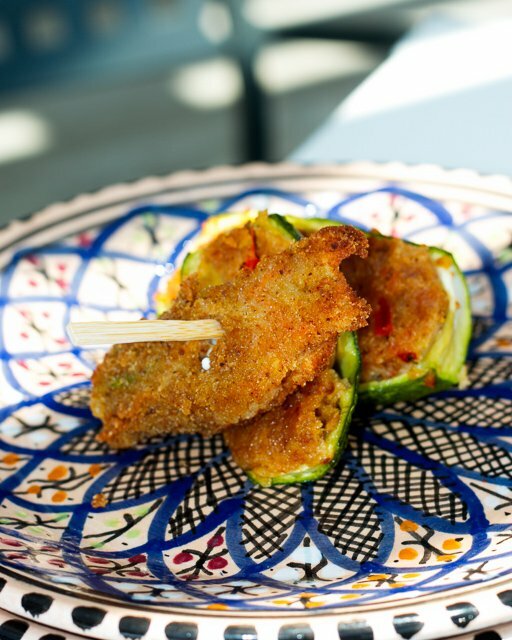 We started with some fried zucchini and cheese, and an outstanding Caponata di pescespada, a dish which captured all of Sicily, and Pantelleria, and my dreams, in one bowl. 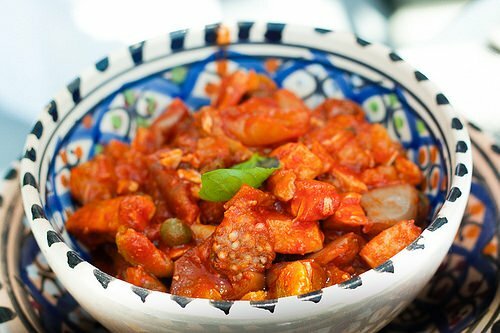 Chunks of fried eggplant, celery, capers, green olives, and cubes of swordfish in a tomato sauce, was just the right balance of sweet and acid. I’m generally not a fan of mushy bowls of vegetables cooked together. But like a good version of ratatouille, when everything is combined, yet each ingredient maintains its integrity in the bowl, well…life is good. Although I don’t eat tuna, due to sustainability issues, since the tuna was local and line-caught, I didn’t feel guilty ordering it. One of my friends said it was the best piece of tuna he’d ever had. 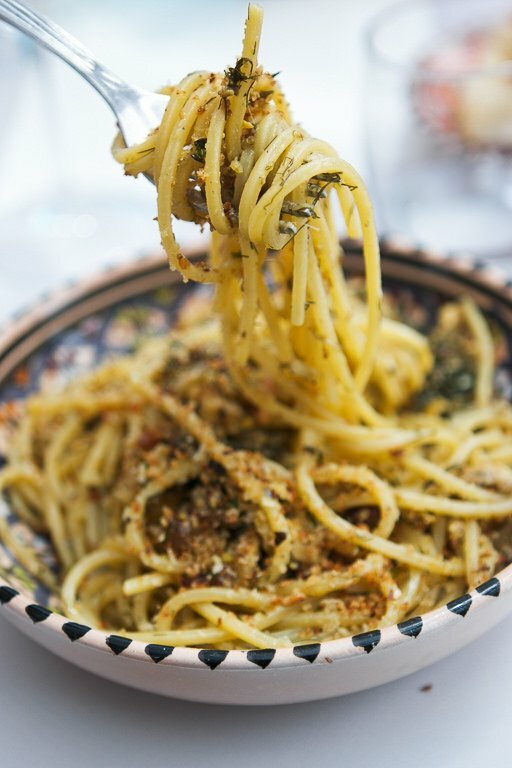 The island is known for pasta with Pesto di Pantelleria, a mixture of tomatoes, herbs, and garlic (although I’ve seen recipes with almonds added, too), topped with toasted breadcrumbs, which are used more liberally on pasta here, than grated cheese. I use them at home, too, keeping a jar of seasoned breadcrumbs on hand to scatter over pasta, which provides a nice textural contrast. Try it! 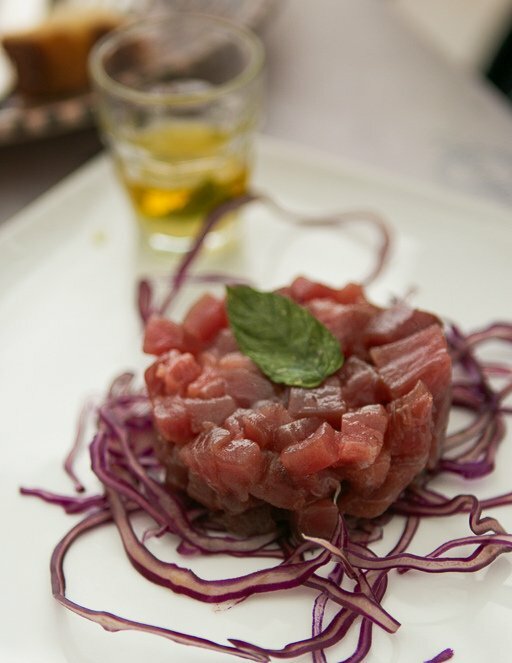 Because we had such a good meal, few days later we returned, and we started with Tartare di tonno, with more of that delicious Sicilian olive oil spooned over the top. Then out came my Chitarra con le sarde e finocchietto. Chitarra is a thin pasta, meant to be cut on a special cutter or chitarra (guitar), with guitar-like wires to cut the pasta. It had mashed sardines in it, as well as fennel fronds, pistachios, and – yes – bread crumbs. Since we didn’t want to seem like we were stalking the restaurant (although we did leave a half-bottle of wine with our name on it there, in anticipation of a third visit), another day we ate at the seaside La Vela (in Scauri), where my friends had eaten quite well the afternoon, before I arrived. However our meal bore no resemblance to their previous one. 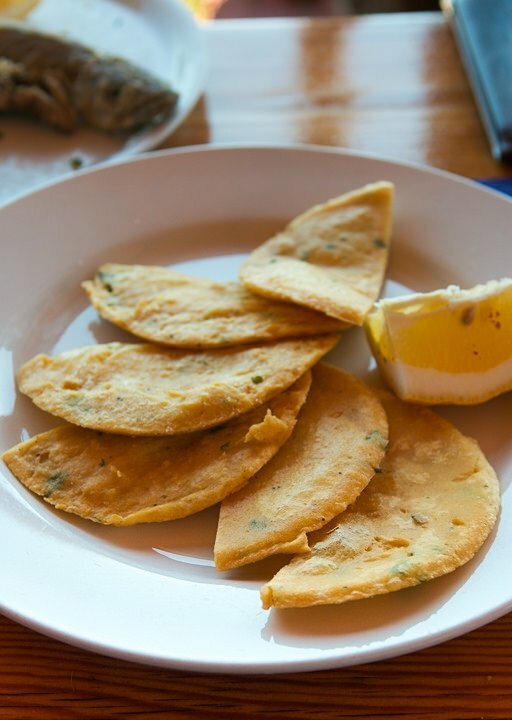 The Panelle (deep-fried chickpea fritters, below) were fine to start with, although they were not especially crispy. But I was so hungry from waiting (and waiting), that I would have eaten a stave off the boat in front of us. 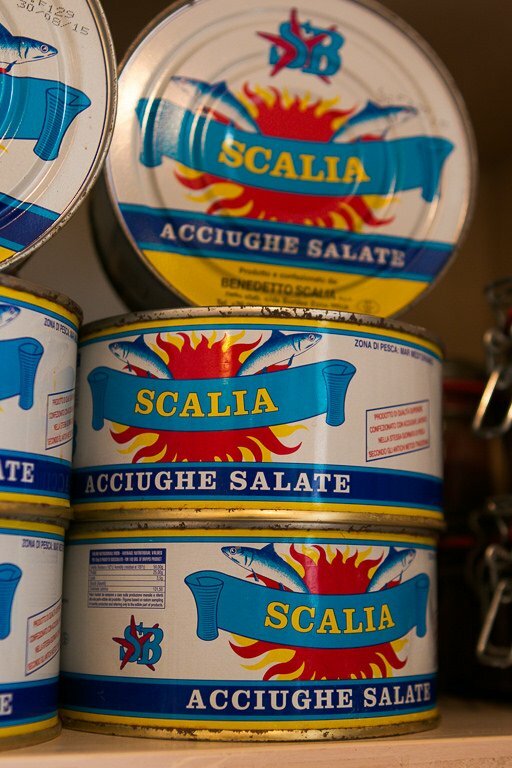 And even though Sicily is known for its stellar tomatoes, we were didn’t find ourselves fighting over the salad they’d brought us, either. C’est comme ça, I suppose. Or however you say it in Italian. As scenic as the view from the restaurant was, driving around the island, it’s easy to come across things like elephante, which I don’t think requires a translation, nor an explanation as to where the name came from. But my idea of nice scenery usually involves fruit trees, growing everywhere imaginable, and bearing fruit just ripe for the picking. Of course, there are tons of lemon trees, and one fellow told me that on the island, they were so abundant that you were lucky if you could sell your lemons for 10 cents each. (Hmm, wonder if they mail order?) Since we were here in early June, we were fortunate that many of the trees were bearing huge, green figs. It’s a variety of fig that ripens early in the summer, then more on the tree ripen again later. 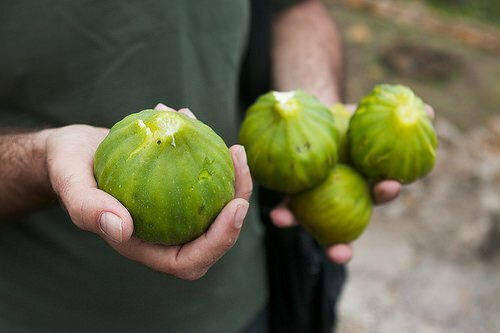 (Giovanni told me they also have black figs, which also have two ripenings, that come later in the summer.) Each was enormous, juicy, and lusciously sweet when ripped into. 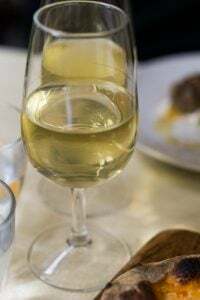 Grapes are also all over the island, and the most famous wine from Pantelleria is passito, made from concentrated Muscat (Zibibbo) grape juices from fruits that have a higher sugar content, as a result of being allowed to dry out under the sun to reduce moisture, and concentrate their flavor. 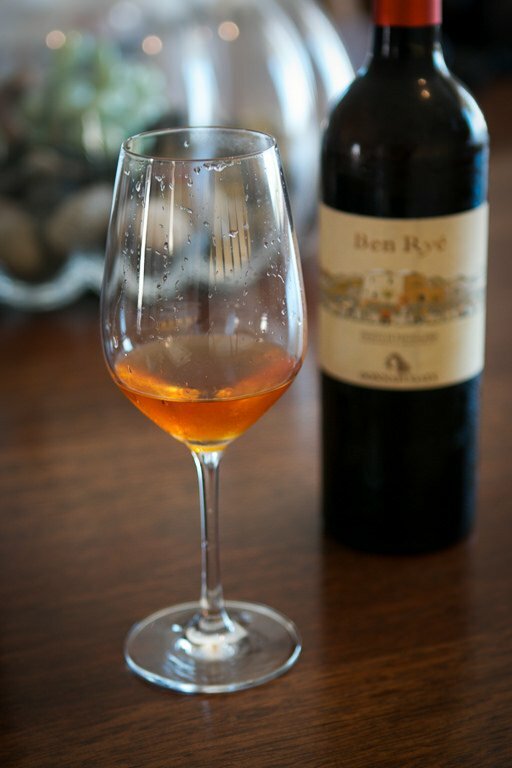 It’s a rather delicious dessert wine, although it can make a nice apéritif before dinner, or with a plate of salumi (charcuterie). But it particularly shines after dinner (or lunch, overlooking the ocean), for dipping biscotti into. 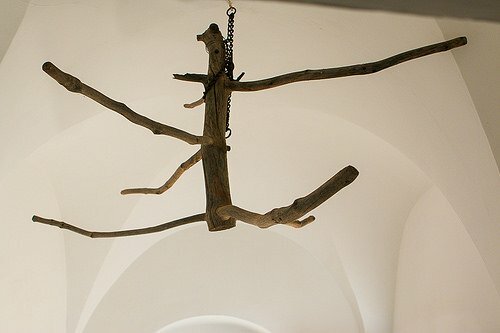 Although wine isn’t susceptible to attack by four-legged scavengers – just the two-legged kind – under the domed ceilings in the home kitchens, there are branches called ninfa, affixed to the ceilings, to hang things out of reach of critters. The only critters we saw were lots of small lizards, some cats lounging around, and a dog that liked to hide behind the road leading up to our house, which would spring out, barking wildly while baring its teeth. He was harmless (and likely bored), but the first time I happened to us, my friend Anissa (who was the courageous driver) and I almost lept out of our skin. 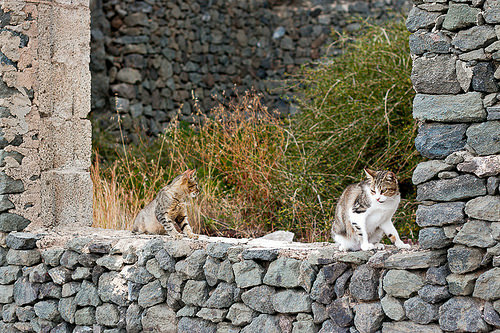 And almost caused Anissa to drive into the stone wall on the very narrow street. As we beat a hasty retreat, she called the dog an *sshole. Because English not her first language, I noted to her that animals couldn’t be *ssholes, only people, as we sped away. For the rest of the week, it become our running joke, as we rounded the bend toward our house, trying to predict at what exact moment the dog was going to come barreling around the corner, and scare the life out of us while we raced up the hill. But the first time, I was laughing so hard, I almost had to get out of the car once we safely got away, to get some extra oxygen because I couldn’t breathe. 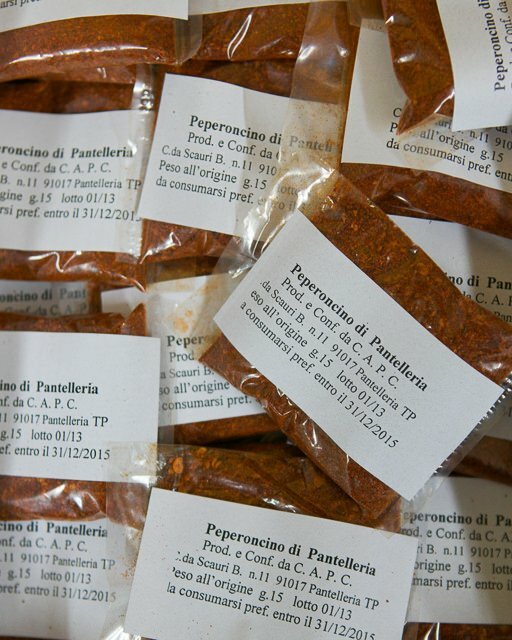 Pantelleria may, or may not, be famous for it’s *sshole animals, but it is famous for its capers, and caper berries, which are more elongated than little round capers (which are sold in two sizes, the smaller ones being the more choice.) 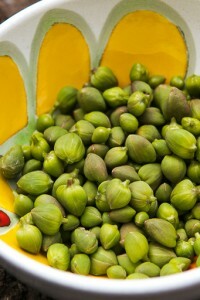 The caper berry resembled a tiny, army-green pea pod. And when Giovanni recommended putting the larger caper berry in a gin Martini, I realized that I should have gone back and gotten another package. Fortunately when I got home, I realize that I did, indeed, buy an extra bag. So my friends can expect a lot of Martini nights in the future. 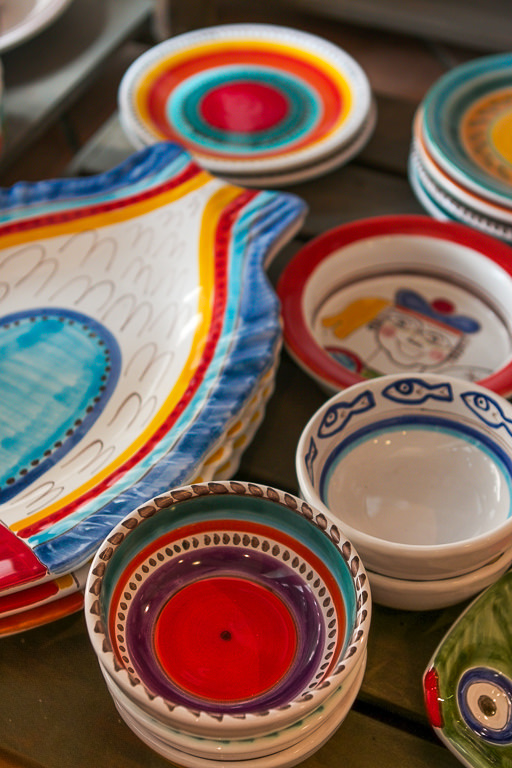 Sicily is also known for colorful pottery, including pieces by De Simone, and two shops in Pantelleria sell it: Emporio del Gusto (which also sells specialty foods from the island), and Ceramiche De Simone (Piazza Cavour, 26). My apartment may be packed to the rafters, but I couldn’t resist buying three plates and a bowl, which effectively used up all the extra space in my small carry-on. When I was extolling the virtues of the terrific new carry-on suitcase that I bought (on an online flash shopping site, for nearly half price), which fits neatly into the recently reduced overhead bins on European discount airlines, someone chastised me for taking a carry-on on airplanes. But as someone online recently said, “Rome airport exists to lose luggage.” And it would have been a tough trip if I only had what I had worn on the plane as clothing for ten days. Plus I wouldn’t have had anything to bring my capers and pottery home in. Which would have been worse. 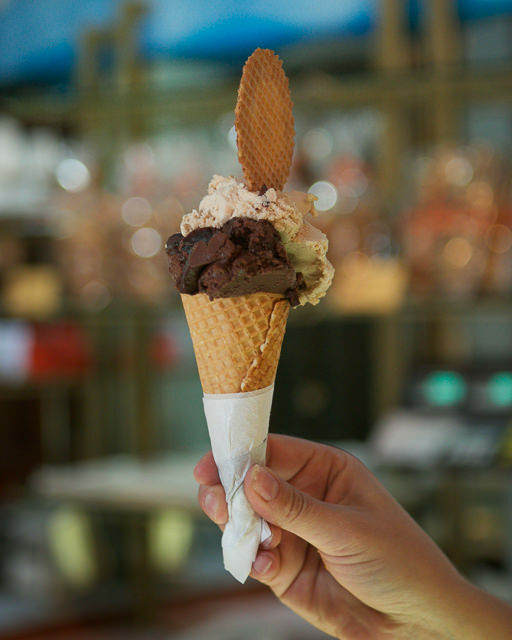 One thing that doesn’t take up any room, though, is gelato, which I loved at Katia Pasticceria (via P. Borsellino), in the center of the main town close to the pottery shops. The owner and gelato-maker let me try all of the flavors. So let’s here it for camaraderie amongst ice cream-makers. (And carry-on suitcases that you don’t get separated from.) His chocolate gelato had no cream or milk, just water and bittersweet chocolate, which is characteristic of the lighter style of gelato that’s eaten in the south of Italy, where hotter temperatures make egg-based, or cream-enriched, gelati a little too rich for comfort. Every flavor was a winner. And while the Madagascar chocolate was my tip-top favorite, gelsi (mulberry), lemon and fig, and Oro Pantesco, raisins marinated in the local Passito wine, were the best of the lot. Because man (and woman), can’t live by gelato alone, we were delighted to find a nice bakery, Panifico Marrone, not-so-well hidden down a set of steps in the village of Scauri. The bakery had wonderful semolina-sesame bread, that staple of the island. 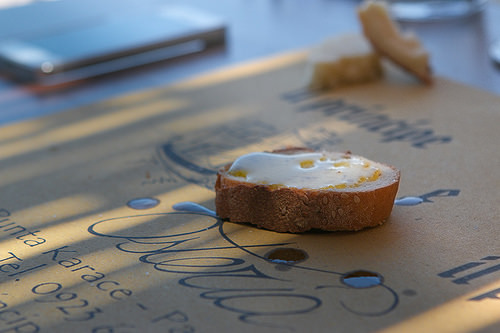 Breads in Italy are often fine when used for soaking up food. But they don’t always stand out on their own. The semolina bread did, and I found myself lopping off slices from the loaves I picked up, along with pretty good squares of potato pizza. Before going to the island, Elizabeth Minchilli tipped us off to the potatoes, which she raved about as being really good. I like potatoes, and France has some pretty great ones. But she was right; the spuds on Pantelleria were stellar. 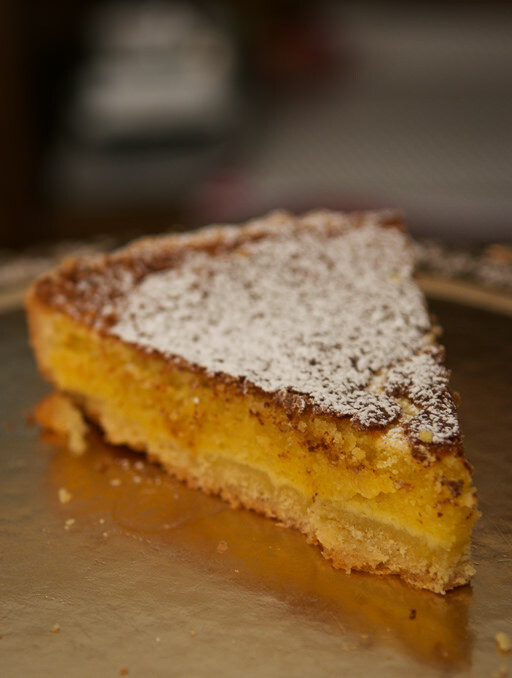 Way on the other side of the island, I was looking forward to the lemon tart that people were raving about so much, at Panificio Terremoto (c/da Kamma 112). So much so, that I would have walked over there if Giovanni didn’t drive me. I declined to taste the raw pasta ravioli another patron hoisted on my friends (from the look on their faces, I figured it was something I could skip), and we went for the softball-size cheese and ham-filled deep-fried fritters. 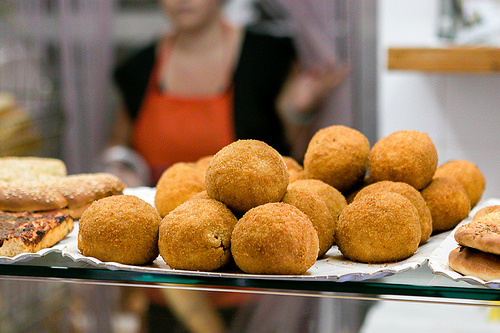 Sicilians do deep-fried right. Our final meal was a winner, at Il Principe e Il Pirata. With a spectacular view, friendly service, we were delighted that each dish was better than the next. Our first course was gambero rosso, red shrimp crudo (raw), which were so utterly fresh, I think they had just been pulled from the water as we pulled into the restaurant’s driveway. Breaded, fried sardines were excellent. And for my main course, I had the Spaghetti alla bottarga con limone e pistacchi di Bronte, pasta with salted fish roe, local lemons, and Sicilian pistachios. 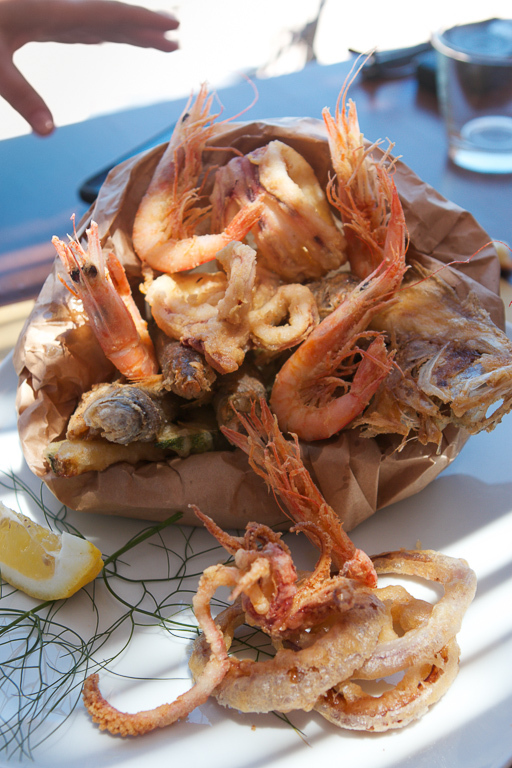 It was good, but the star was the Frittura di pananza, a tumble of deep-fried seafood, along with zucchini and onion rings, that was brought to the table, spilling out of a large paper bag. Being American, and missing them a lot, I fended off my non-American dining companions for the onion rings. Which wasn’t really a problem, as they were busy attacking the fried sardines, squid, and other tasty creatures from the sea. 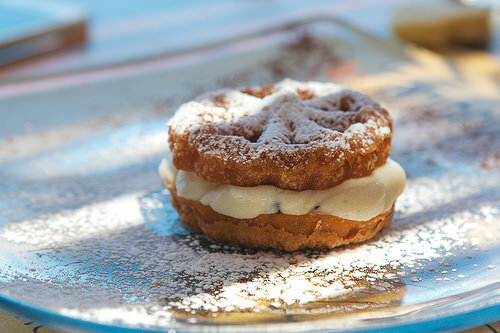 We finished up with an ethereal Baci di Pantelleria, a thin crispy shell, encasing an absolutely divine ricotta cream. 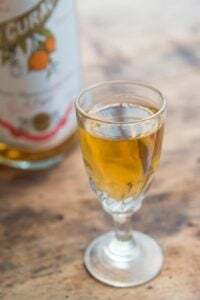 (Recipe here, in Italian, and here, in English.) It was one of the best things I’ve eaten in the last decade. 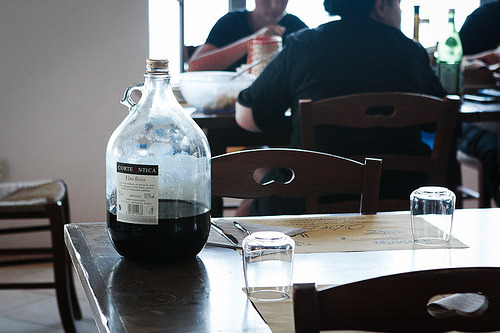 As we left the restaurant, the staff was just sitting down to eat — and drink. 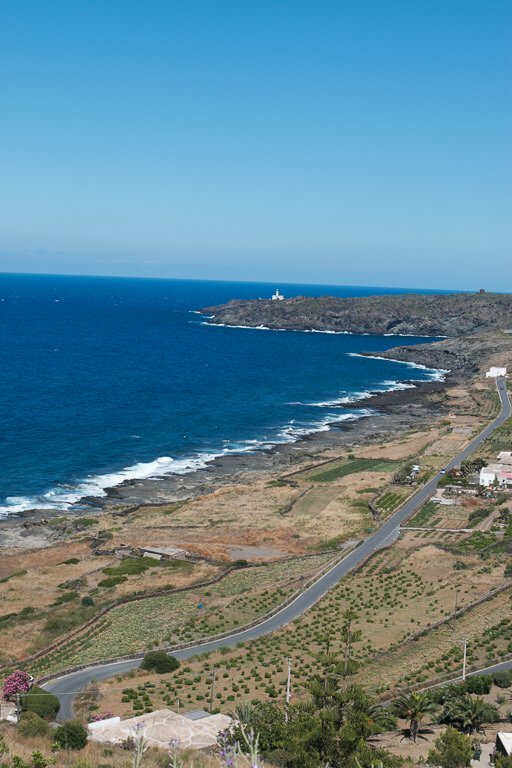 And the next day, back home after three flights, I had post-Pantelleria depression. I don’t quite know how such a simple place could have such an effect on me, and I want to go back. I would have to say, though, that Pantelleria probably isn’t for everyone. The island is gorgeous, and in spite of an *sshole dog, the whole effect is very relaxing. For those looking for excitement, nightlife, and predictably excellent seaside restaurants, it’s hit-or-miss. The most “happening” time of the year is August, when lots of people flock to the island. I would skip it then, and come during other summer months, or in the fall. 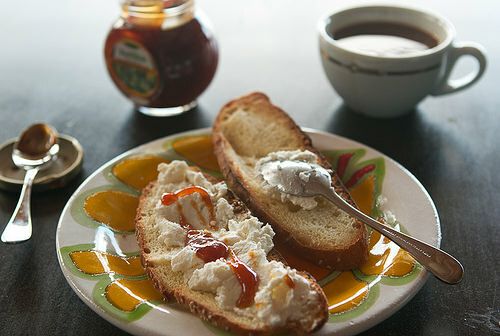 Now that I’m back home, I miss my morning toasted semolina bread with fresh ricotta and brusque, dark eucalyptus honey. 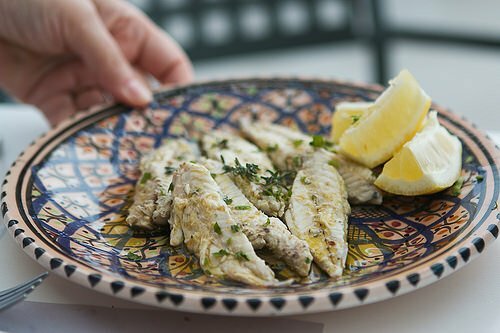 But I have three unbroken plates and a small bowl (thanks to a carry-on suitcase), plenty of capers and caper berries, and a few lemons that I should really use as soon as possible, to hold me over, until my next visit to Sicily. I can’t get over the hand-sized fig! Looks like an amazing trip! 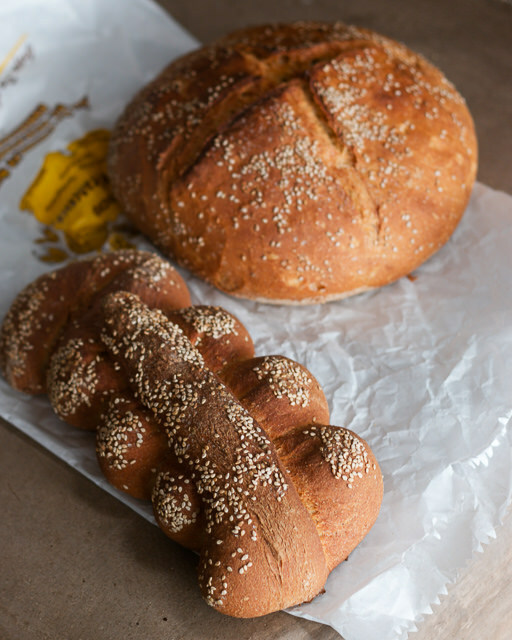 for anybody who can’t get to pantelleria themselves … marie’s bakery aka policastro bakery in hoboken nj have always made an outstanding braided semolina-sesame loaf: dense, moist, a little chewy, tender, a meal in itself. this bread may also be available at citarella in nyc. just saying. mangia! I love “traveling” with you. You include the little details that bring the place to life and make me feel like I got to go too. Thanks for a very enjoyable account. This took me forever to read because I looked up all your links; I have seen (but never used) people in Italy and Switzerland (Italians mostly!) use the ‘mandolins’ as we called them (not knowing that they were actually ‘chitarras’…. and some of the best fresh pasta I ate came from a small Florentin corner shop where they had – every day of the week – some 12-15 different pasta, linguine, filled shapes (and none were ‘simple raviolis’…) – gosh, I get a pasta ache right now! What a great upload – and thank you for the extra photo tips from 2008 onwards – I am on my 3rd Canon, the first one was the best but also wayyyy to heavy – but with different lenses I could do bokeh & macro, a thing I very much miss with my SX30 IS. On the other hand, it’s much lighter, and you can do amazing landscape shots – but definitely no close-ups (which is a pity). I felt as if I were on a little Sicilian vacation myself while reading this–then I came to the end and alas, here I am, still not in Sicily. Looks like an amazing and beautiful trip. I had twelve uncles of Sicilian descent. Only one is left. And I think he is somehow related to the *sshole dog in Pantelleria. What wonderful descriptions of this solitary island. 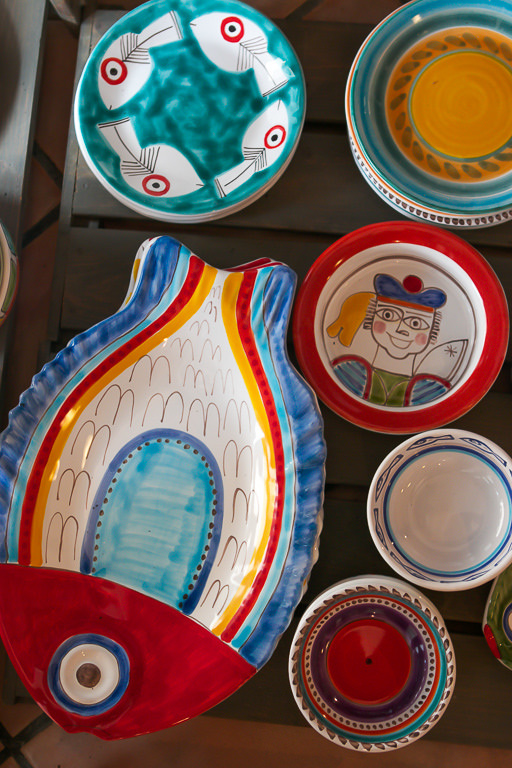 The pottery is very much Sicilian in style and I love your honesty of how the restaurant food is hit or miss, so very laid back and carefree. 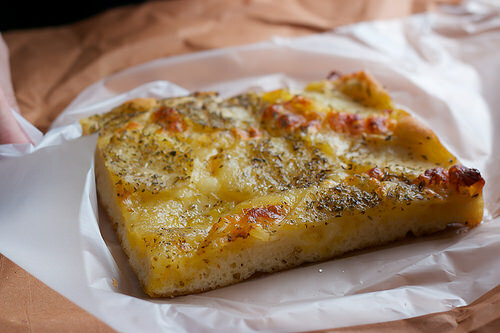 The Frittura di pananza did seem to be the food highlight but I have looked up every link you have given and will now search for this famed semolina bread. This is my favorite thing I’ve read all week. Simply perfect. 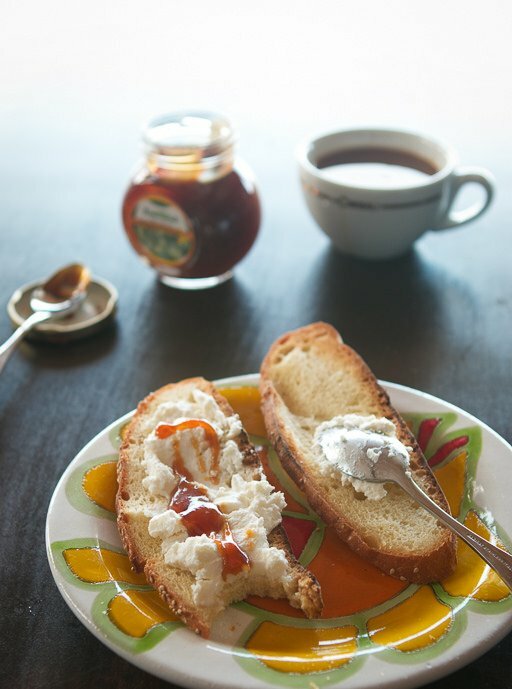 And now I’m craving crusty semolina bread with fresh ricotta cheese and dark honey. I really, really loved this post, David. And I take back what I said about my uncle. That was not a very decent thing for me to say. And I apologize to the *sshole dog. Super evocative post, David! You have really brought the island alive – your next book should be about gastromic travel, i.e. holidays based solely on the search for interesting food! Greetings from BRU! One of the best posts ever! Felt like I was on holiday with you and certainly wish I could have been. Thanks for taking me a place I will add to the proverbial bucket list! Happy Summer! I’m jealous! 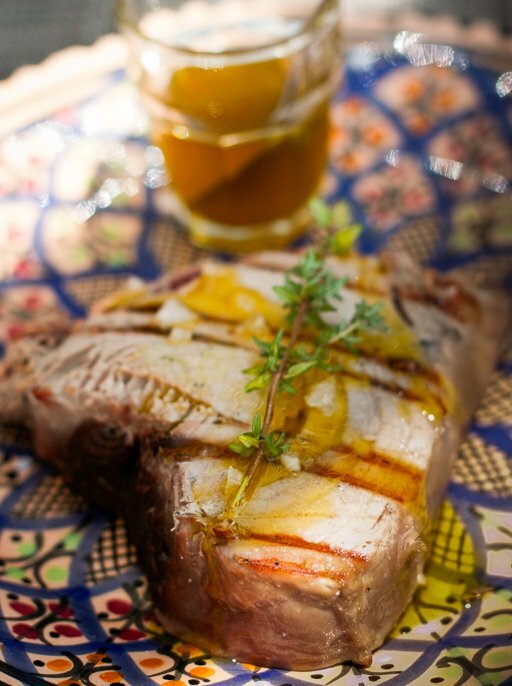 This looks like a wonderful holiday, experiencing the culture,food and people of Sicily. Will definitely put on my “places to visit-list”! My kind of place. 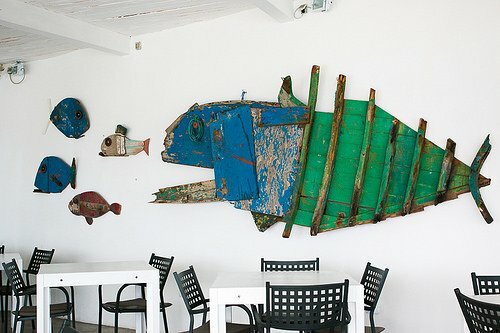 Living in the Vendee I’m so used to restaurants being crappy one and crappy the next that Pantelleria sounds heaven. The quiet and simplicity of it charms me. I have to go there. Lovely post. I gotta say that although some of your meals didn’t turn out to be as good as you would’ve expected, those dishes were everything. Beautiful colors, and beautiful designs (probably hand painted?) Gorgeous photography as well! S I G H ! Just lovely. Inspirational, and what delightful pictures! Good that I’m reading this at lunchtime, because now I need to go track down some seafood….and plan a vacation. This was one of your best posts! It was a vacation for the eyes. Your photography is excellent. Clear, positioned perfectly and thoughtfully and portrays the view or dish with outstanding detail. Perhaps all the techies out there could upgrade our PCs to smell and taste the photographs. Now that would be true tech advancement. 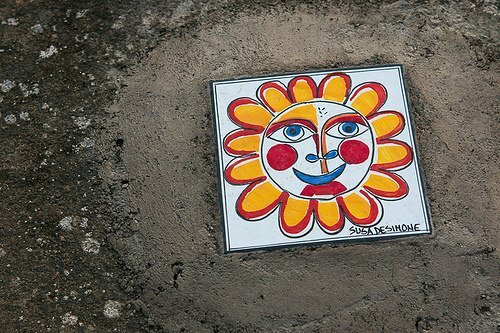 David, thanks for the beautiful photos and your amazing travelogue! I always enjoy reading about your adventures! I had just started and my mouth was already watering! Traveling with you is so educational! 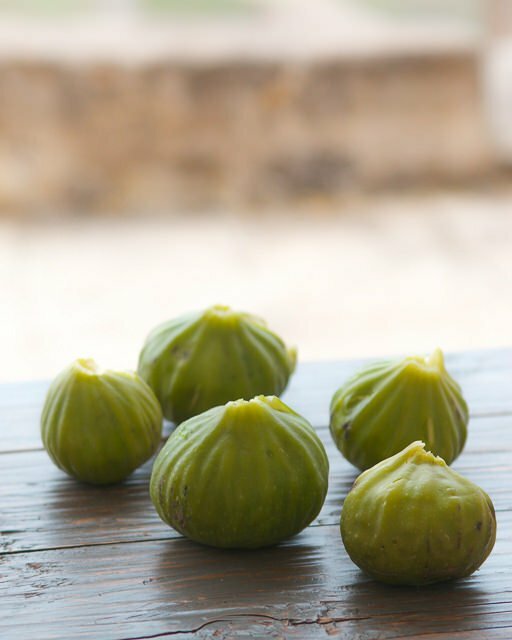 Wow those figs, non-milk gelato, chickpea fritters, fresh tuna etc…and all the great scenery. All of Italy affects me the way you describe. It’s like being homesick for a place that has never been my home. Odd. Maybe in a former life. Thanks for a great post. I think Americans have a great affinity for Italy, since there was such a large wave of immigration of Italians into various American cities, and a lot of Italian foods (and culture) are second nature to us. Linda, that means you should move there. That’s why you feel that way! Linda H that is precisely how I would describe my encounters with Italy and with Portugal. I don’t get to travel to Europe as often as I would like, but upon journeying to Südtirol/Alto Adige and Trentino, afterward I brought home an irresistible urge to return. Something about the impossible shapes of the Dolomites, the local people who have so much civic pride (the region’s towns and cities are spotless) – and the great respect that the people have for the past without being constrained by it. As a cheese fiend I had to restrain myself bringing home more than the hunks of Puzzone di Moena and Weinkäse hidden in my checked bag. 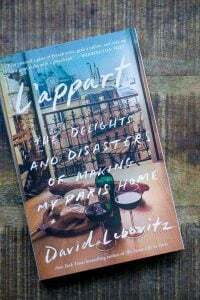 Reading about David’s jaunts to Sicily and islands really winds up my wanderlust – thanks again for bringing us all along vicariously – and what a feast for the eyes as well. 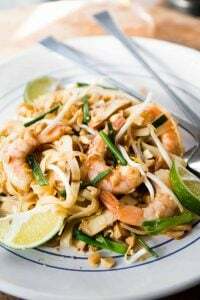 C) Love that you are being honest about the meals, sometimes when you travel to beautiful exotic little corners of the world it is entirely possible to have very mediocre meals. Sounds nice but can’t compare to the island where my father was born (Hvar) and where we’re lucky to have an apt. on the piazza. The tourists are definitely like pest gnats in July and August, but the rest of the year the island is the best fairy tale on the planet. Hvar isn’t in Italy :-), and when Conde Nast Traveler celebrated their 10th anniversary they had a feature on the 10 most beautiful islands in the world; Hvar was on it. You should check it out. My cousin Vjekoslav owns one of the most popular restaurants there, Alviz (with the little “v” mark over the z), which is our family nickname. It’s not gourmet but it is delicious, so cozy and rustic and fun. 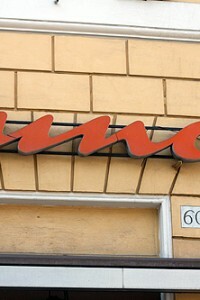 I think the best restaurant there is Divino and you’d love it. If you go in 2 weeks I’ll see you there :-). One more thing….Hvar in the summer turns completely Italian, not a word of Croatian can be heard for all the Italians speaking loudly as they do! Several years ago my boyfriend and I were buying our catamaran tix to get to Hvar, and he asked the Italians in front and behind us why they came to Hvar when they had Sardinia, Capri, and the rest? And they replied simply, “because it is more beautiful here.” Happy 4th!! Wonderful travelogue. It was a real delight to read it. 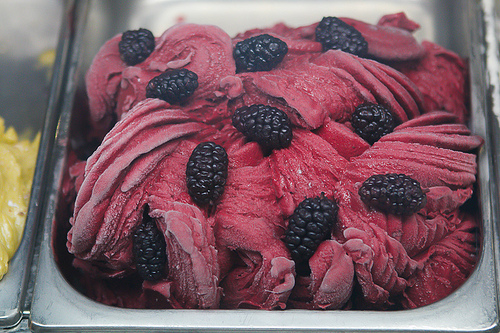 I’d be interested knowing more about the cream-less gelato as I live in Dubai and at this time of the year (40+ degrees) it’s too hot for even ice cream, which becomes sticky and sits heavily on your stomach. The slices of semolina bread with ricotta drizzled with honey reminds me of keymak, a Turkish breakfast dish (increasingly rare) that I managed to track down in Istanbul. 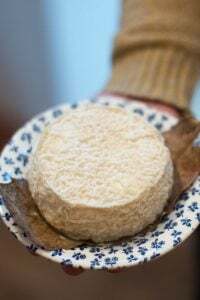 It’s basically a thick smear of mascarpone style cheese on a plate, drizzled generously with honey and served with thick slices of Turkish white bread (which is similar to “Italian” bread). You take a spoon or knife and smear some of the cheese/honey on the bread and eat! It’s one of those very simple combinations that truly hits the right spot. I’m surprised the mascarpone / ricotta and honey combination isn’t more common. What a trip! 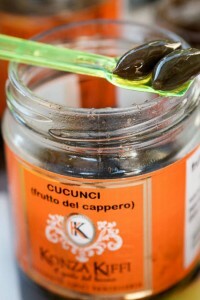 I am craving to go to Sicily now! Thanks for sharing this David! I have to share this with my daughter and son-in-law who live in Italy—one more place to visit and chill out in this coming year!! Really enjoying your writings from Sicily and feel that I need to go ASAP. I agree with Anissa (whom I met at a cafe in Covent Garden some years ago at a food festival and we had a coffee and a chat together), that a dog can be an *sshole. My friend’s dog hates me and eventually at Christmas, he managed to bite my leg and draw blood. 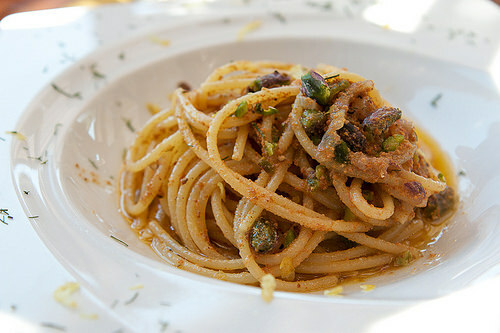 I have been eating pasta con le sarde a lot recently. It’s great and makes a very cheap meal. I keep breadcrumbs handy too. I love the texture with pasta. After your article mentioned the sun dried cherry tomatoes, I decided to have a go by slow roasting them in the oven. I peeled them and roasted them for several hours at a very low temperature, but when I took them out of the oven, I thought I’d just try one and ended up eating half, just like sweets. They were gorgeous. I put the rest in a jar with some dried herbes de Provence, slices of garlic and covered them with oil. I ate them the next day on bruschetta, even more gorgeous, and then used the lovely flavoured oil on a salad. So, thanks for giving me the idea for those, I’ll definitely make them again and next time try not to eat them all before they’ve had a chance to mature a bit. Thanks for letting me tag along. I was interested in your carry-on bag, but the link was broken. I was able to reach the shopping site, but it did not have a search function. A little help, please? The bag I got was a Tumi Alpha 2, the “international” version, which is smaller than the regular one, so it conforms to most European budget airlines specifications. (I thought it was expensive, but at half-price, it was a good deal – plus I’ve saved a lot on checked baggage fees, too.) They keep changing models & the one I have seems to have been replaced with a more updated model, so I linked to their carry-on page. One of my guests on a tour had a similar bag and recommended it, as well as Rue La La, which I joined as a result. Rue La La doesn’t have a search function since the items offered change daily. There is a site in France that is similar, Vente-Privée, where they also feature Tumi bags from time to time. Don’t be cruel, David. Where is the chocolate gelato recipe from this wonderful trip? 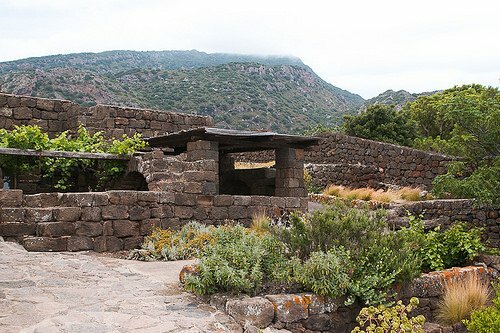 Thanks for taking me to Pantelleria. I got the travel again bug now! This post reminds me why travel is great. Thanks for letting us tag along. What a wonderful account of a wonderful place! I just came back to the US from a 2 week trip to Europe; of the four countries I visited, I liked Italy the most. I got sick on the last few days of my trip and lost my voice. When I was checking out of the hotel, the nice lady at the front desk commented that I must have left my voice in Rome. Actually I think I left my heart in Italy; I want to go back, the sooner the better. I love adding bread crumbs to my pasta! And that ice cream looked heavenly! 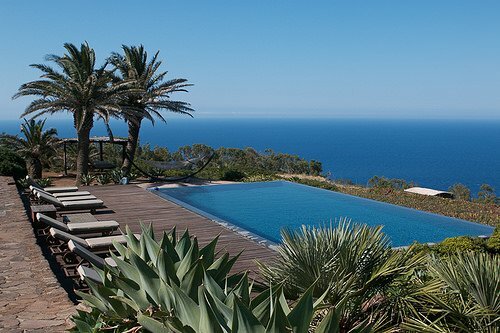 Thanks for sharing your thoughts on Pantelleria. I’ve never been so I enjoyed learning about this beautiful place! If it were me, I’d preserve those fabulous lemons. Yum! Beautiful photographs. That ice cream looked amazing. Looks like you had a great time. Those figs! That honey drizzled over the fresh ricotta! I am a longtime reader but I don’t think I’ve commented before here. I HAD TO though after reading your last few posts about being in Italy – there was just WAY too much goodness going on!!! I want to eat everything you ate!!! What is the weather like in Pantellaria in the winter months. Looks like a beutiful winter getaway. Thank you for the wonderful posts. 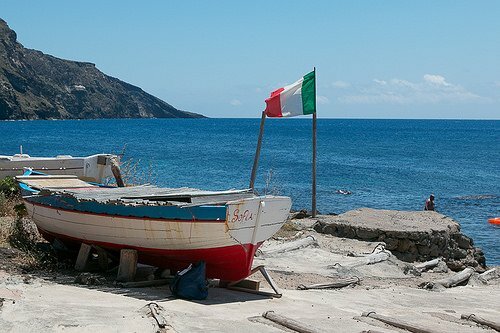 I have been meaning to write for a while – your reports on Sicily and Pantellaria really hit home and made me terribly homesick for Sicily, especially. My mother’s family are from Naples and her step-father was from Palermo – Italian mothers – being what they are – she ruled the roost, believe me. I was born in San Francisco (but now live in London and work as a teacher) and we had a very strong Italian influence while growing up. My ex-partner is from Catania and the years we were together included multiple trips to Sicily and his family. 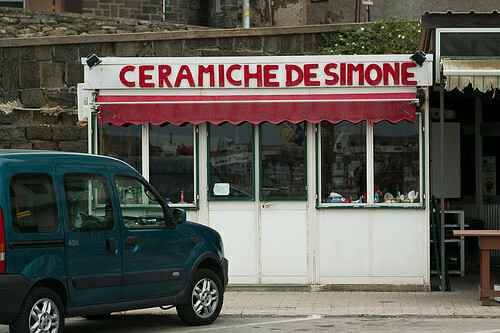 Sicily is truly one of my most favorite places in the world – I know you can understand that. On one trip we went to visit another friend and his family near Trapani. I came down with bronchitis and couldn’t go out to play with the others so I spent a few days with Andreas’s mother – watching films on tv, hearing the family gossip and cooking – while I recuperated. One of the days she sent me out in the garden to collect snails. She then made a magnificent pasta sauce with them which I remember until this day. She also taught me how to make a really lovely Caponata. My brother owns a restaurant in Hawaii (French) on the Big Island – he and his wife visit Paris every 2 years and I see them then. He is the one who alerted me to your blog. 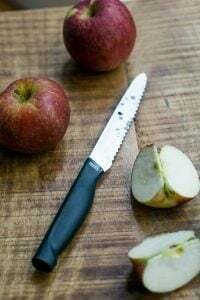 I have also worked as a chef – no formal training – in a restaurant of some friends on the Ile de Re – which was a wonderful 4 months, and cooked in a few wine bars/restaurants in London while at college. Thank you, so much, for all you have written – I enjoy your stories and humor a great deal. I will be spending a few weeks in Paris this summer – looking after a cat in the 6th – and am compiling a list of markets and other places from your blog to visit as I’ve not heard of some of them before. The only problem is – I will be there on my own and won’t be able to buy too much as I’ve no one to feed – not that that usually stops me from experimenting but my waist could use a bit of reduction about now. 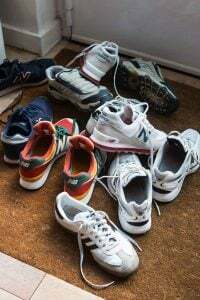 I suppose I could always just invite strangers in but I may become a bit confused as to my true intentions when I start choosing my prospective guests – if you know what I mean!!! Anyway, thanks again. By the way, I have been forwarding your writings to Giuseppe (who also still lives in London) and he loves them too. What a serene and beautiful place – thanks for taking us there. The purpose of my comment, though, is to thank you for the caperberry tip. We bought some for our gin (as if there’s any other kind) martinis over the 4th of July weekend and absolutely loved them in the drinks. 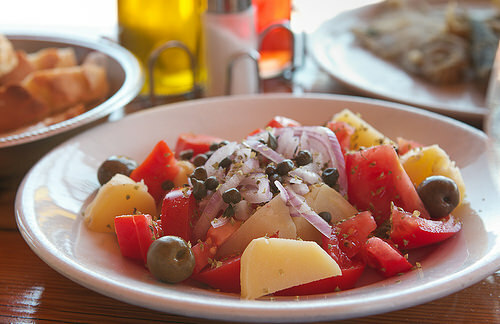 Olives or lemon twists be damned – it’s caperberries from here on out! OMG! Grazie! I Ioved reading this! I was in Sicily in 2013 and had the best pizza EVER in Riposto (just east of Etna) at Pizza Bella Napoli, and I’ve had lots of pizza in Italy, and I’m of Sicilian origin. Hope you have the chance to go there one day. Sicily is beautiful! Miss it so much! I am highly amused at the thought of animals being *ssholes. But thinking about it, my dog could maybe qualify after having trampled over all the garlic in the garden today. Your picture of the deep fried seafood is gorgeous. 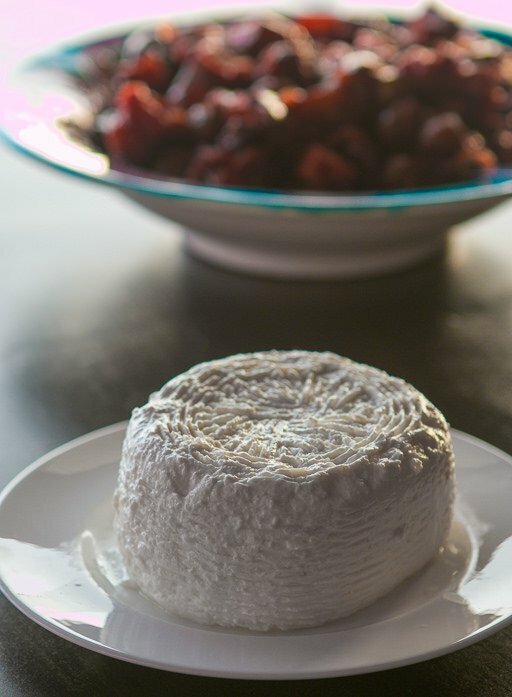 And the fresh ricotta. I could eat it off the screen.